I'm following the Holacracy movement with great interest. When I read their constitution here I kept saying to myself surely success is simpler than this. Perhaps this is a quest like Einstein I believe suggested "We need to make everything as simple as possible yet no simpler." In work with my clients my quest is always about simplification without losing the profound. One way I do this is to continually ask the question of processes, policies, procedures, practices and systems, Does this mean it's simple for people to bring their best to their work? We're glad to have you with our Company. Our number one goal is to provide outstanding customer service. Set both your personal and professional goals high. We have great confidence in your ability to achieve them. Rule #1: Use best judgement in all situations. There are no additional rules. Please feel free to ask your department manager, store manager, or division general manager any question at any time. 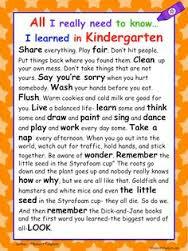 25 years ago, just before I left the corporate world to start my own practice, I was inspired by the book All I Really Need To Know I Learned in Kindergarten by Robert Fulghum. This book inspired me to create one page business plans, strategy documents and performance plans. Since such one-pagers have become a keystone of my client work helping 1000's of people to maintain focus and improve performance. Recently the celebrations around the 800 year anniversary of the Magna Carta have renewed my passion for creating one page constitutions or charters for organisations. Watch this space. If you'd like to collaborate on this or know of something that already exists please get in touch with me.